The photography world is only just coming to appreciate the late Vivian Maier, whose prolific work from the 1950s and ’60s mostly went undiscovered until shortly before her death in 2009. Maier’s first New Jersey exhibition opens at Morristown’s 70 South Gallery this Tuesday, June 19, 2018, and the show should be fascinating not just for its stunning cityscapes and portraits, but for what they reveal about the enigmatic artist who created them. “Everybody wants to understand the mystery of her,” says gallery Director Ira Black. Maier was a nanny who spent her spare time shooting thousands of photos — and kept them secret from even her closest friends. A realtor discovered the photos at a Chicago auction. 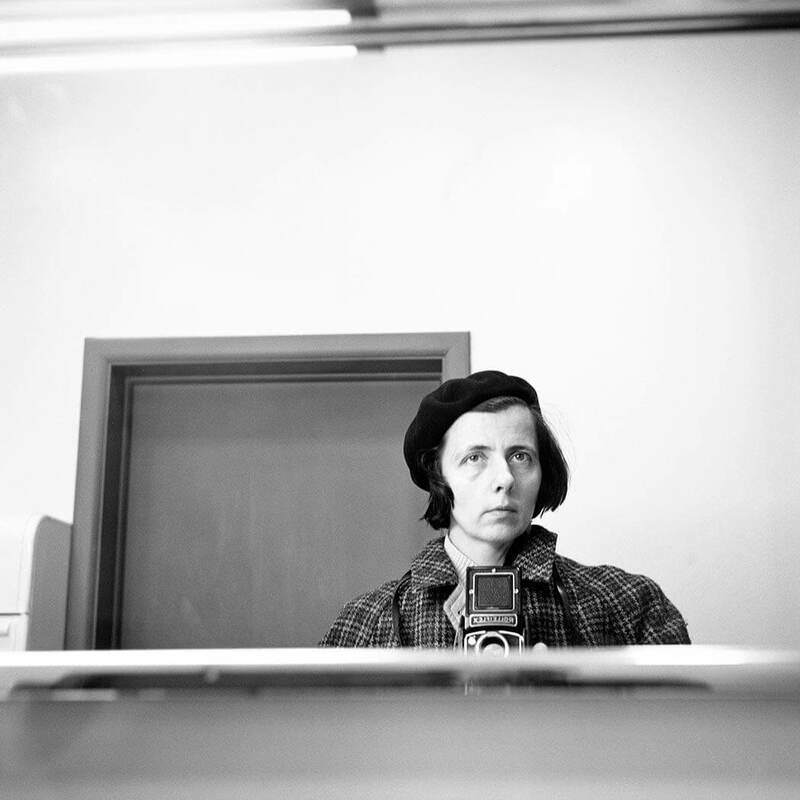 The 2013 documentary Finding Vivian Maier was nominated for an Oscar. Black’s favorite photograph in the show is the only one that depicts Maier’s entire face. She is staring somberly into a mirror, while wearing a beret and fur coat reflective of her years in France. Photos by the late Vivian Maier receive their first New Jersey exhibition at Morristown’s 70 South Gallery in June 2018. Twenty-two limited edition (15 copies only) darkroom prints are on display, and for sale. Admission is free to the exhibition, which runs through August. It’s curated in a way that invites viewers to “sit and take it in, and take their time with it,” says Black, who secured the artworks through a childhood friend with close ties to New York gallery owner Howard Greenberg. Maier’s pictures of people she passed on the streets of New York, Chicago, and Los Angeles are both humorous and intimate. She often used a Rolleiflex, medium-format camera she could hold at chest level. This allowed her to make eye contact with her subjects while taking shots. Critics speculate this made Maier’s subjects feel comfortable, with natural “unvarnished” results, Black says. There is a deeply human feel to Maier’s work. “Anybody with an interest in photography, history, or our own humanity will find something of value in this exhibition,” Black suggests. The gallery also is showing photos by seven students, including Morristown High School alumni Kelly Ganning and Fiona Mullen. Tuesday’s opening reception starts at 6:30 pm. Please RSVP here. On Wednesday, June 20, the gallery will host a free concert featuring Sane Insane, a rock/blues/jazz band comprising musicians from Mexico and Columbia. They play from 7:30 pm to 9 pm, as part of a summer series presented by the Mayo Performing Arts Center. Carly Cannavina, Morristown High School class of ’18, will study English at George Washington University in the fall. Kevin Coughlin contributed to this report. Previous articleMorristown’s Santi good luck charm for Mexico in World Cup?